In 1861, Texans voted to leave the United States and join the newly formed Confederate States of America. They began preparations for the inevitable civil war, including raising an army. Locally there was much discontent about the prospect of leaving Texas to fight on the eastern front, resulting in low rates of volunteerism into the Confederate Army. This sentiment drew the ire of newly-elected Governor Francis Lubbock who vigorously supported Confederate conscription, opposed draft exemptions for able-bodied men as unfair and the substitution system as advantageous to the wealthy. Aliens, including those born in Mexico, Ireland, Germany and elsewhere, residing in Texas were also made subject to the draft. However, Gov. Lubbock exempted frontier counties, including Bexar, from the Confederate draft and enlisted their residents for local defense against Indian attack. Many residents of Garza’s Crossing (present-day Von Ormy) and the surrounding areas initially opted to form their own Texas Militia unit rather than join regular Confederate Army. Dr. Theodore Heermann, who resided on Quesenberry Road on land he purchased from the Hernandez family, organized the 30th Bexar Militia, known as the "Medina Guards." The call went out to all able bodied men and they mustered on October 21, 1861 at the Herrera Ranch at Paso de las Garzas. J. K. Harper 1st Lieut. Of these 64 men, 11 brought pistols, 20 carried rifles, 24 possessed revolvers and 45 owned horses. The Medina Guards, a cavalry unit, rode to San Antonio and reported to Brig. 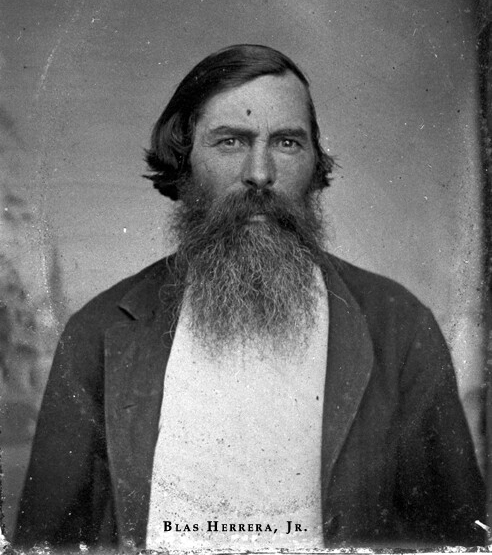 General R. M. Braham of the 30th District Texas Militia, who gave orders to drill as a light infantry unit. This caused great concern among the men who understood the perils of facing Indian attack on foot. The resulting discord bought an end to the Medina Guards. The 45 men on horseback were transferred to Company B of the Texas 2nd Cavalry under command of Capt. Charles L. Pyron, known as Pyron’s Mounted Riflemen Other area men had already joined this company,. The remaining 14 were assigned other State Militia units. Capt. Pyron’s Company was given orders to ride to Ft. Stockton, then onward to join the Confederate Army of New Mexico under Brigadier General Henry Hopkins Sibley. The other units under his command were the 4th Texas Mounted Rifles and 5th Texas Mounted Rifles (both of which had batteries of mountain howitzers), five companies of the 7th Texas Mounted Rifles, six companies of the 2nd Texas Mounted Rifles (which also had an artillery battery attached), and several companies of Arizona Confederate mounted volunteers. On December 20, 1861, General Sibley, in command of the Army of New Mexico, issued a proclamation taking possession of New Mexico in the name of the Confederate States. He called on the citizens to abandon their allegiance to the Union and to join the Confederacy, warning that those "who co-operate with the enemy will be treated accordingly, and must be prepared to share their fate." Sibley envisioned that he would invade New Mexico with his army, defeat Union forces, capture the capital city of Santa Fe and then march westward to conquer California and add it to the territory of the Confederacy. Sibley's first step was to gather an army in El Paso, Texas and lead it north along the Rio Grande with the objective of capturing Fort Craig and the supplies in the fort and defeating the Federal army under Colonel Edward Canby. On Jan 3, 1862, Sibley left El Paso with three regiments and one partial regiment of mounted Texans comprising 2,510 officers and men. Fort Craig, 140 miles (225 km) north of El Paso, was the major obstacle in his path. Canby awaited him there with 3,800 men of whom most were infantry. Only 1,200 of Canby's men were seasoned soldiers. The remainder consisted of 2,000 New Mexican volunteers, 100 Colorado volunteers, and 500 militia. Kit Carson commanded the First Regiment of New Mexican volunteers. Sibley led his brigade to within fifteen miles south of Fort Craig during the evening of February 13. Judging the fort to be too strong to be taken by assault, Sibley deployed his brigade in a line for the next three days, hoping to lure the Federals into the open, but Canby, not trusting his volunteer troops, refused to attack. As they were down to a few days rations, the Confederates could not wait indefinitely, so at a council of war on the 18th, Sibley ordered the army to cross the Rio Grande and move up the eastern side of the river to the ford near Valverde, six miles north of Fort Craig, hoping to cut Union communications between the fort and their headquarters in Santa Fe. Next morning, February 21, Sibley sent an advance party consisting of four companies of the 2nd Texas Mounted Rifles under the command of Major Charles Pyron to scout ahead to the Valverde ford, with the 4th Texas Mounted Rifles under Lieutenant Colonel William Read Scurry following close behind. The rest of the brigade remained in camp, intending to follow later. Union scouts informed Canby of the Confederate movements towards the north. Canby then sent a mixed force of infantry, cavalry, and artillery to the ford under the command of Lieutenant Colonel Benjamin S. Roberts of the 5th New Mexico Infantry. The infantry and artillery slowed the column down, so Roberts sent Major Thomas Duncan ahead with the cavalry to secure the ford. Following Roberts' departure, Canby sent additional reinforcements from the fort's garrison, and assigned several companies of New Mexico volunteers to "watch the movements of the enemy, threaten his flanks and rear, and impede his movements as much as possible." When the Confederates under Pyron arrived at the eastern side of Valverde ford they found that Union forces were already there blocking their passage. Pyron sent for reinforcements from the 4th Texas while his men took cover in an old river bed, which served as an excellent defensive position. At first, despite having a numerical advantage, the Union cavalry deployed in a skirmish line instead of trying to drive the Confederates out of their position. This forced the Union artillery to remain on the western bank of the Rio Grande. When Scurry arrived, he deployed his regiment to Pyron's right, with the regimental artillery on the Confederate left. Although they had gained a numerical superiority, the Confederates were mostly armed with short range shotguns and pistols, which couldn't reach the Union positions three hundred yards away; the Confederate howitzers also couldn't reach the Union artillery on the far bank of the river. Meanwhile, Canby ordered most of the remaining garrison at Fort Craig to march to Valverde, leaving behind some militia to guard the fort. When he arrived, Canby moved most of his command, including the artillery, to the eastern bank, leaving the First New Mexico Volunteers under Carson and the Second New Mexico Volunteers under Colonel Miguel Piño on the western bank as a reserve. By early afternoon, the remainder of the Confederate force, the 5th Texas Mounted Rifles under Colonel Thomas Green and a battalion of the 7th Texas Mounted Rifles under Lieutenant Colonel John Sutton, arrived at the battlefield, much in need of water and denied access to the river by the defending Union forces. Sibley, who during the morning had remained with the wagons, relinquished command of the brigade and Green took over, who then handed command of the 5th Texas over to Major Samuel Lockridge. Around 2:00 pm, Green authorized a lancer company to attempt a charge on what they thought was an inexperienced New Mexico company on the Union extreme right; however, the Union soldiers turned out to be a Colorado company which was able to defeat the charge without breaking. Twenty of the lancers were killed and wounded during the charge, with almost all of the horses disabled or killed as well. When it returned to the Confederate line, the lancer company rearmed itself with pistols and shotguns and continued fighting in the battle. This was the first and last lancer charge of the American civil war. By 4 p.m., the Union appeared to have the advantage in the battle. Canby decided that a massive frontal assault would fail and instead decided to attack the Confederate left; to do so, he ordered one of his batteries on his right to redeploy closer to the Confederate line and moved several companies to his right, including Carson's First New Mexico Regiment which crossed the river and took its place in line. However, this repositioning of the troops weakened the center of the Union line and the battery on Canby's left. Hoping to stall the Union attack, Green ordered Major Henry Raguet to attack the Union right with his battalion; this attack was repulsed by frontal fire and a flank attack from the 1st New Mexico, and the Union right advanced after the retreating Confederates. At this time, Green ordered the Confederate right wing under the command of Scurry to charge the Union center and the battery on its left; the attack force of 750 men was arranged into three successive waves. Nor the least of the motivation of the Confederates was their desperate need for water which could only be reached by dislodging the Union troops blocking their access to the Rio Grande. The shock of the Confederate charge caused over half of the battery's supporting force to rout; Lockridge was mortally wounded during the attack. The Federals countered with a cavalry charge, but the main Confederate force continued to press their assault on Canby's left flank, capturing six artillery pieces and breaking the Union battle line, which soon turned into a panic-stricken retreat of both regular troops and New Mexico volunteers. Sibley was about to order another attack, when Canby sent a white flag asking for a truce to remove the bodies of the dead and wounded, to which Sibley gentlemanly agreed. Canby managed to reorganize his men, minus about 200 deserters from among the New Mexico volunteers, and ordered a retreat back to Fort Craig leaving the road northward toward Santa Fe open to the Confederates. Left in possession of the battlefield, the Confederates gained the victory but had suffered substantial casualties, reporting 36 killed, 150 wounded, including Pvt. Francisco Herrera, son of Blas Herrera, who lost his right arm. Due to the strength of the fort's walls, Sibley decided to abandon his attempt to capture the fort and instead continued northwards towards Albuquerque and Santa Fe, where he hoped to capture much needed supplies. However, he was severely hampered by the losses in horses and mules from the battle, which forced him to dismount the 4th Texas as infantry and to destroy some supplies and wagons. Canby reported that his forces had 3 officers and 65 men killed/3 officers and 157 men wounded/1 officer and 35 men missing for a total of 264 He also had additional missing and deserters, mostly deserters, thus suffering a 16 percent casualty rate, including deserters, of about 432 men out of 2,800 men engaged. Considering himself to be outnumbered, he chose not to pursue Sibley, instead sending mounted detachments of New Mexico volunteers against the Confederates' rear for harassment. He would remain with the main body at Fort Craig to cut off the Confederates' supply line and to intercept reinforcements for Sibley, eventually hoping to pin the main Confederate main body between himself and Union reinforcements from Fort Union. Neither Sibley nor Canby received high marks for their generalship during the battle. Sibley was indisposed by alcohol and illness and spent most of the day riding in an ambulance. Col. Green was the defacto commander and it was his aggressive attack on Canby's center and left that won the battle. Canby blamed the New Mexican volunteers, mostly Hispanics, for his loss—but his decision to reinforce his right while weakening his center and left was the real cause of the Union defeat. On Canby's right wing, Kit Carson's regiment of New Mexican volunteers saw only limited action but comported itself well. The volunteers were advancing and thought they were winning the battle. They were incredulous when Canby gave the order to retreat. By the 20th the Confederate army, under cover of the hills between it and the river, was opposite Fort Craig. [Confederate Col. Thomas] Green attempted to place artillery on the heights overlooking the river and fort, but Canby had anticipated the move forcing the Texans to make a 'dry camp' on the night of the 20th. About midnight, Union Captain James Craydon tried to blow up a few rebel picket posts by sending mules loaded with barrels of fused gunpowder into the Confederate lines, but the faithful old army mules insisted on wandering back toward the Union camp before blowing to bits. Although the only casualties were two mules, the explosions stampeded a herd of Confederate beef cattle and horses into the Union's lines, so depriving Green's troops of some much-needed provisions and horses. Due to the loss of horses at Valverde, the 4th Texas had to be dismounted, with the remaining horses, already in a weakened state, distributed among the other units. They also had lost much of their transportation in the battle at Valverde, causing them to carry the wounded. All this caused the column to travel slower than it could have. Canby meanwhile attempted to trap Sibley's army between his own force and Fort Union. He disbanded his militia and most of the volunteer units, and sent most of his mounted units northward to act as partisans and to "obstruct [Sibley's] movements if he should advance, and cut off his supplies, by removing from his route the cattle, grain, and other supplies in private hands that would aid him in sustaining his force." Sibley, whose mission was to capture Fort Craig, outmaneuvered Canby at the Battle of Valverde in February and drove Canby back to his fort, but failed to force Canby's surrender. Instead, Sibley bypassed the fort, and advanced up along the Rio Grande Valley to seize Santa Fe on March 10. Canby remained at Fort Craig to cut Sibley's logistical support from Texas and to await further reinforcements before resuming the offensive. Sibley set up his headquarters at the abandoned Union storehouse at Albuquerque. Starting on February 23, the Confederate forces reached Albuquerque on March 2 and Santa Fe on March 13, but due to their slow advance they failed to capture most of the Union supplies located at these cities. The slow advance also allowed reinforcements from Colorado under the command of Colonel John Slough to reach Fort Union. Since he had been commissioned colonel before Paul was commissioned the same rank, Slough claimed seniority and took command of the fort. Canby had already ordered Paul to "not move from Fort Union to meet me until I advise you of the route and point of junction." After learning of the change in command, Canby told Slough to "advise me of your plans and movements, that I may cooperate." He also instructed Slough to "harass the enemy by partisan operations. Obstruct his movements and cut off his supplies." Slough interpreted this as an authorization to advance, which he did with 1,342 men from the fort's garrison.
. With limited supplies and ammunition and outnumbered, Sibley choose to retreat to Texas, leaving Albuquerque on April 12 after a small fight a few days earlier. On April 14, Canby encountered the Confederates at Peralta, where the armies skirmished until 2:00 p.m. when a sandstorm permitted the Confederates to withdraw. The retreat continued through Mesilla to San Antonio, during which hundreds of Confederates straggled and fell behind. Most of Pyron’s Company B retreated through Coahuila Mexico in order to avoid Comanche territory. They arrived in Laredo in May and joined with Col. Santos Benavides for the reminder of the war. Francisco Herrera retuned to Von Ormy to recover from the loss of his arm. Following the war he served as the first schoolmaster in Von Ormy. This is good history, and also good local history. Thanks for including the photo of Blas Herrera, who lived at Paso de las Garzas, and his many descendants also lived there. I am a descendant of the Ruiz-Herrera Family.I see some very strong family resemblances. Blas Herrera looks very much like my father, David Herrera Vargas. Thank you so much for preserving this history! My great-grandfather was Sgt. Erastus T Dunson of Company B, 2nd TX Cavalry as listed above.